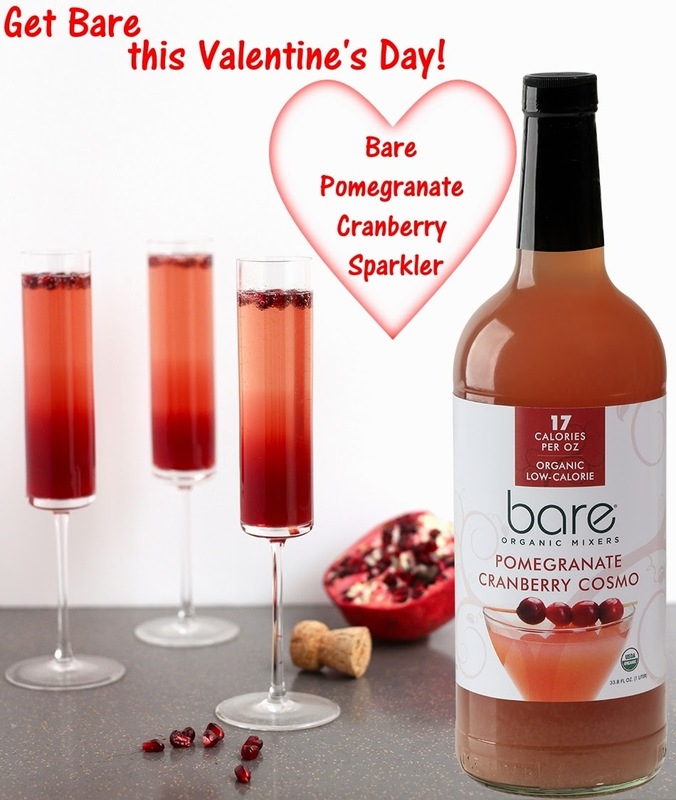 Bare Organic Mixers wants you to get "Bare" this Valentine's Day with their Bare Pomegranate Cranberry Sparkler recipe. Bare Organic Mixers are a naturally low-calorie, flavorful, organic and light tasting cocktail mixers that are made with fresh organic fruit juices and agave nectar created by Natalie Susi. Bare comes in a variety of mixers such as margarita, lemon drop and pomegranate cranberry cosmo that blend well with nearly any liquor or spirit or can also be enjoyed straight up on the rocks. All of their mixers make great tasting clean cocktails with less than half the calories without any fillers unlike other brands on the market. * This recipe makes 6-8 servings. 2. In a small saucepan combine orange rind, agave and water. Bring to a boil over medium-low heat and stir with a wooden spoon until sugar is dissolved. Remove from heat and allow syrup to cool completely. Remove orange rind and discard. Chill simple syrup until you are ready to use it. 1. In a pitcher combine orange simple syrup, Bare Pomegranate- Cranberry Cosmo, and orange juice. Stir to combine and chill until ready to serve. 2. To serve cocktail add a few pomegranate seeds to each champagne flute. Fill flutes 1/3 of the way full with juice mixture. Top with champagne. Disclosure: Recipe and photo is courtesy of Bare Mixers. I want to use agave more in recipes and now I can make an orange simple syrup using it. Bare sounds like a good organic all natural product. I shall look for,it,in Whole Foods supermarket.